Opening Keynote: Karen G. Villholth (GroFutures) and Jude Cobbing. Presentation: Thokozani Mtewa,Evance Mwathunga and Wapulumuka Mulwafu. UN-Water is presently seeking feedback on their SDG 6 Synthesis Report, which will help inform the assessment by the High-Level Political Forum on Sustainable Development (HLPF) of the progress of achieving the Sustainable Development Goal 6 (SDG 6) on Clean Water and Sanitation. The assessment of SDG 6 is part of a larger effort by the HLPF to assess a number of SDGs on a revolving basis. SDG 6, among four other SDGs, including on energy, cities, consumption and land, will be discussed at the HLPF summit in New York during 09-18 July 2018. It is critical that the SDG 6 Synthesis report properly reflects the progress achieved and outstanding challenges going forward. On the latter, groundwater comes in as crucial. There is no doubt that the majority of the global population depends on groundwater, either directly from drinking it and using it in households, but also indirectly through the food they eat, as almost half of the world’s food production today derives from groundwater, a figure that keeps increasing. However, the immense societal value of groundwater is not captured commensurately in management efforts on water. And we see the consequences now. Depleted aquifers, salt and seawater appearing in our groundwater, and farmers being squeezed because they cannot afford to access groundwater anymore, with broader scale impacts on food and international security, from local to global levels – among other socio-economic, health and environmental consequences. Groundwater underpins invaluable ecosystems, which we only see when it surfaces as lakes, perennial rivers or springs. Groundwater is fundamental in achieving safe and adequate water supply to all, leaving no-body behind and providing water and services that support a significant number of other SDGs. Hence, getting groundwater management and monitoring done more comprehensively for the achievement of the SDGs is absolutely crucial. Responding to this urgency, GRIPP submitted a commentary and plea to UN-Water to appreciate their increased attention to groundwater in their assessment of SDG 6 progress, while also highlighting the gaps that remain. One aspect is to increase the awareness of the intrinsic, but also direct economic value of groundwater. Another is to ensure that the resource is used efficiently and sustainably, and meeting basic needs of everybody. As part of this, more efforts are required to collect information on the resource status on a regular basis and feed this into the relevant SDG indicators, e.g. on water quality, water stress, integrated water resource management, transboundary cooperation, and water related ecosystems. GRIPP, as a consortium of about 30 institutions with dedicated expertise on groundwater, stand prepared to help on these intricate, but critical challenges related to groundwater. The sooner this is done concertedly, the sooner, we can start turning the tide, and finding solutions, which will require partnerships, efforts and investments at all levels, from local users to governments to the HLPF. If we start now, we still stand a chance of succeeding, and of handing over a planet that keeps supporting life from below. Reliable access to water is still a problem in Africa. The Groundwater Solutions Initiative for Policy and Practice (GRIPP), a group of 30 international partners, is committed to providing greater security of supply and sustainable management. The focus: groundwater. Africa’s economy is growing. Technical developments, a broader middle class and a lively start-up scene are used in the media and in countless panel discussions to document the popular “Africa Rising” narrative. What many people forget, however, are the smallholder farmers who are, in fact, the driving force of the continent. No economic activity in Africa is more important than agriculture and none is so fragile. The main reason is water – especially when it is missing. Already, 17 countries, many of them in the east and south of the continent, are struggling with drought for the second year in a row, writes the international media organization IRIN. If there is no regular and sufficient rainfall, the farmers can neither feed their cattle nor farm the fields. Harvest failures and famines are often the result. According to IRIN, more than 38 million people are directly affected. “In a drought, all we see is dried-up riverbeds and withered fields everywhere. Often, however, the solution is so close,” says Jeremy Bird, former Director General, International Water Management Institute (IWMI), an international research institution that addresses food security, poverty and the effects of climate change through better water management. One aspect that is becoming more and more important: groundwater. More than 30% of the world’s freshwater reserves are stored below the Earth’s surface. The demand for the valuable resource keeps growing continuously. A study by the University College London and the British Geological Survey (BGS) determined that up to 660,000 km³ of groundwater is located under African soil – more than 100 times the renewable surface water resources of the continent. Using this hidden treasure responsibly and sustainably is particularly important for the world’s dry zones. One of the biggest hindrances to raise awareness about the enormous importance of groundwater is that it is invisible. “Rivers or reservoirs are visible when they dry out or become polluted. If the same happens to groundwater, hardly anybody takes notice,” explains Bird. Dr. Karen Villholth, Principal Researcher, IWMI, says “Water scarcity has to be considered in a relative context in Africa. On the one hand, water resources are lacking in many places, but, often, it is actually the financial resources which are lacking to access existing groundwater resources.” The expert from IWMI, Pretoria, South Africa, attended the 8th Water Research Horizon Conference in Hamburg in mid-September, a conference with leading water scientists from around the world. There, she spoke not only as a groundwater specialist, but also as the international GRIPP Coordinator. GRIPP, short for Groundwater Solutions Initiative for Policy and Practice, is a consortium of 30 international research institutions, companies and nongovernmental organizations (NGOs), founded in 2016. It is working across the world to improve groundwater management, particularly in rural and agricultural areas in developing and emerging countries. 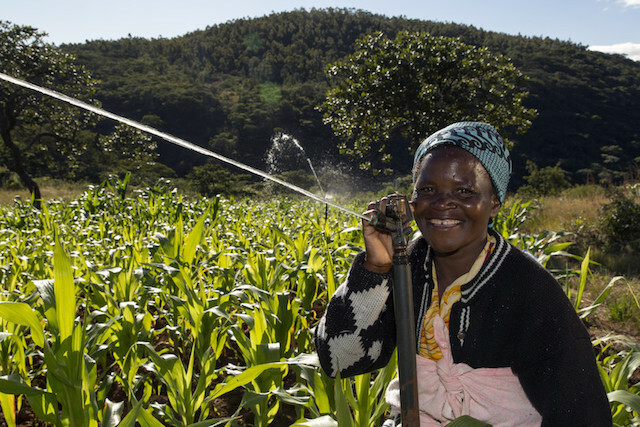 In sub-Saharan Africa alone, there are plans for the implementation of various research-for-development projects for groundwater-based irrigation systems. The overall investment catalyzed partly through GRIPP is aimed to exceed USD 1 billion until 2030. The goal is to irrigate an additional area of 600,000 hectares. In addition to technical solutions, the focus also lies on issues of ‘good governance’, ensuring long-term water management on a local, national and international level, which is better adapted to the needs of the population. IWMI is leading GRIPP, with several United Nations organizations and partners from Africa and Germany participating, including the Africa Groundwater Network; the Association of Water Well Drilling Rig Owners and Practitioners (AWDROP), Nigeria; the Center for Advanced Water Research (CAWR) with experts in Dresden and Leipzig, Germany; and the Federal Institute for Geosciences and Natural Resources (BGR), Germany. Dr. Ralf Klingbeil, Senior Expert, Department of Groundwater and Soils, BGR, is the contact person for GRIPP. “As a scientific institute, we naturally have very close ties to relevant research organizations and can, in addition to our technical expertise, also provide numerous contacts to institutions, authorities and companies in the partner countries,” explains Klingbeil. In the past, BGR has been active in groundwater projects in Botswana, Cameroon, Namibia and Zambia. Currently, projects are under way in Burundi, the Maghreb countries and also with the river and lake basin organizations of the Niger River and Lake Chad. Klingbeil emphasizes the great importance of the subject for the private sector. After all, any company that invests in Africa would want to secure basic location factors such as reliable energy and water supplies. “For German companies, there are various opportunities to get involved,” says Klingbeil. Companies could support local multiple use (for agriculture and drinking) water supplies, or contribute to the financing of infrastructure for groundwater monitoring or artificial recharge. If the operations are in the vicinity of their facilities, the companies stand a better chance of being successful. 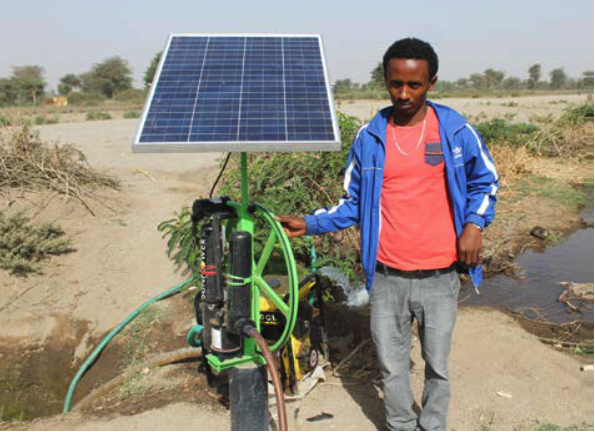 Currently, one of the main problems is the lack of functionality and maintenance of already installed well systems, reports Seifu Kebede, Professor of Earth Sciences, Addis Ababa University, Ethiopia. “In rural areas, on average, not even half of the systems are working properly when they are needed. If you additionally consider the water quality, the quota falls below 30%,” says Kebede. An approach for long-term solutions can only be developed with an interdisciplinary approach with a mix of innovative technological developments, trained specialists, and willingness to cooperate for lasting and long-term commitment at governmental level, as well as a stronger awareness in society. The very same approach that GRIPP pursues. “I’m looking forward to the results of this important initiative,” says Kebede. A social and natural science approach to enabling sustainable use of groundwater for the benefit of the poor.